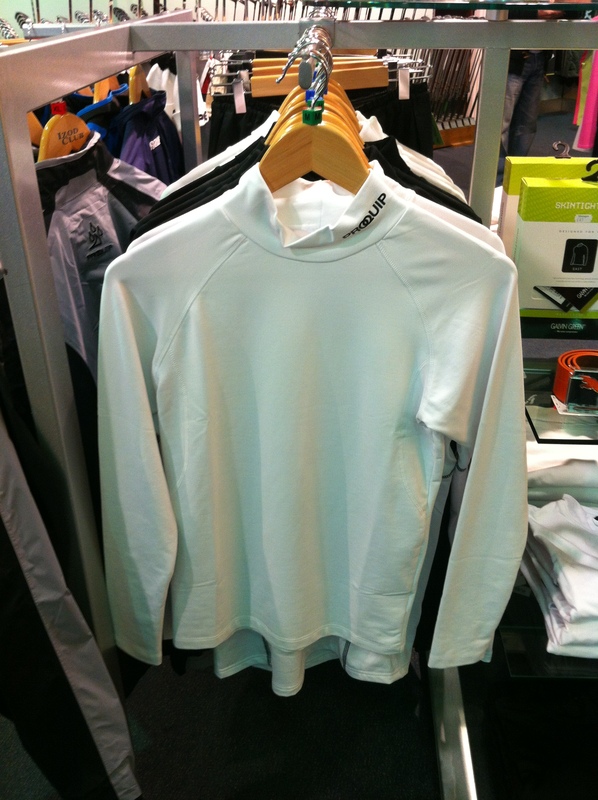 During the winter period the temperature can drop quite severely to freezing temperatures, which can then cause the golfer to “layer up” just so he/she can stay warm during a round. Well now you don’t have to as much, you can simply wear a base layer. 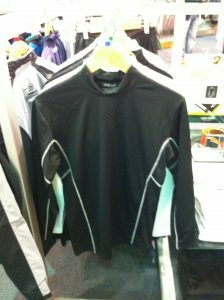 These base layers act as a second layer of skin as it clings to your body tightly, thus causing minimal heat evaporation, which will consequently lead to staying warmer with fewer clothes on. This is enabled by its polyester and elastane mix of materials, this extremely tight woven garment means that it is very tight on your body, however, you do NOT loose any range of movement within the body. 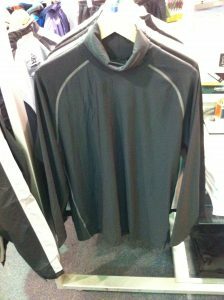 This garment still allows you to move and swing freely. 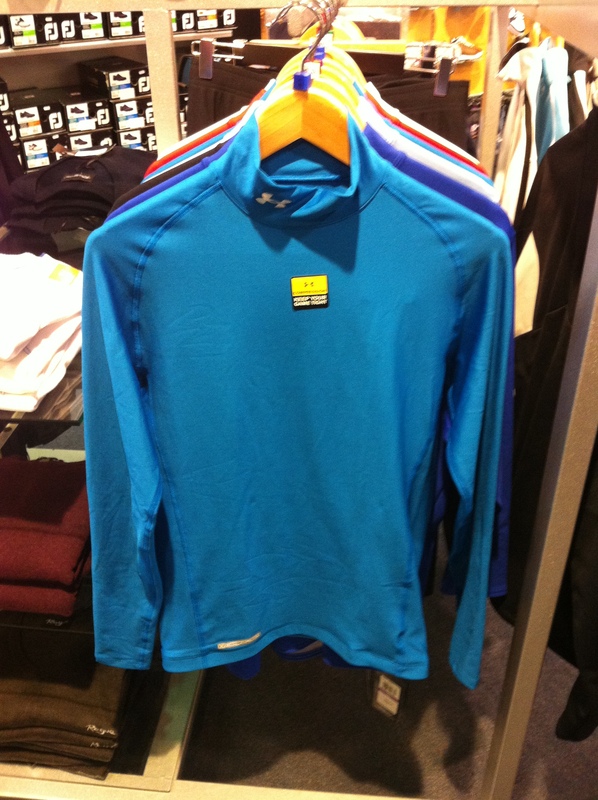 The base layers compress on your muscles, causing them to activate and generate more power. 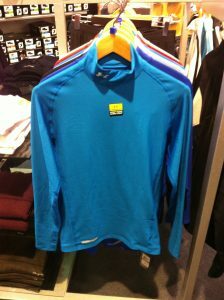 The base layers come with anti-odour technology and moisture transportation technology, this causes any moisture created by the body to be pushed away to the surface of the garments causing any moisture to dry faster. The garments also have a 4 way stretch fabrication which allows the garment to be stretch every way possible and still maintain its shape whilst also not restricting the body’s range of movement. We have various sizes and colours in all brands available in store now. 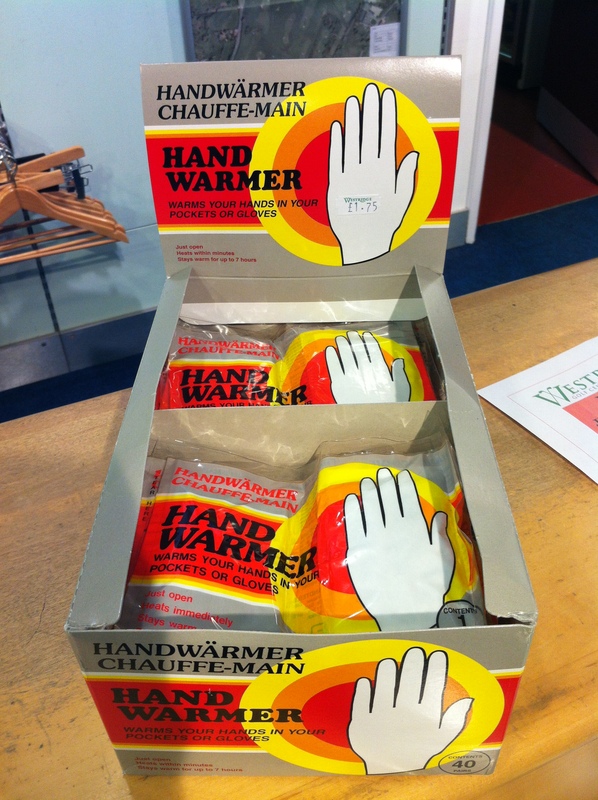 During the course of the winter we are expected to get rain, wind and cold temperatures. Which means you need to be correctly equipped with the right clothing, accessories and equipment to aid you in a round of golf. These 11 accessories, clothing and equipment are essential for you as a golfer, to enable you to stay warm during the round of golf. 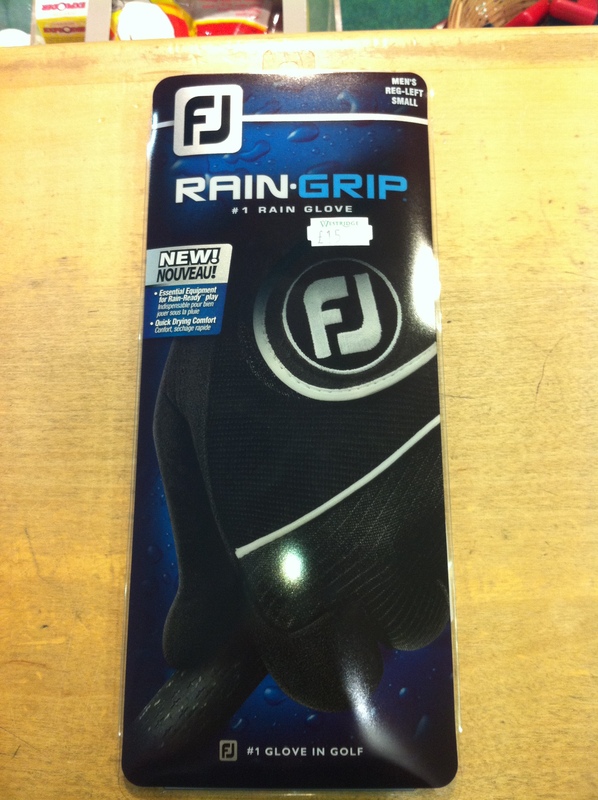 Which therefore causes the golfer to not stiffen up and stay flexible. Double Cannopy Umbrella - To fight the gusty winds and keep the rain of you. 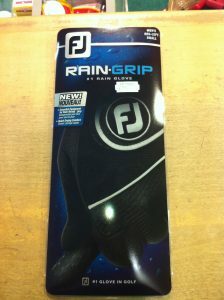 Bag Rain Cover - to keep your clubs, bag and grips dry. I would also reccomend using a lower spinning golf ball in the winter, as ground conditions are generally softer and in high winds a lower spinning golf ball will travel straighter. A perfect golf ball to use would be the Wilsonstaff DX2 Soft Golf ball, which has a soft outer layer on which creates a soft feel off all the clubs, however, has a lower spinning core which is perfect for windy conditions. If the Posture is the foundation to a swing & the Grip an essential marriage then your Alignment is the key to making it all work like a well oiled machine. Poor alignment is like trying to drive a car in a straight line with the steering wheel turned to the right!! You may laugh but golfers around the world do this day in day out. 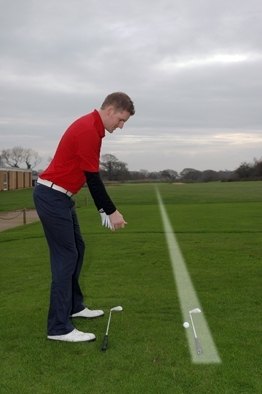 1.Start off with 2 clubs on the ground, 1 where the ball is & point it towards your target. 3. Remove the club by the ball and take your posture with your FEET, KNEES, HIPS & SHOULDERS parallel to the club at your feet. You may now feel that your pointing to the left of the target but the club face will now be taking dead aim at the flag! Over my 3 blogs you now have the 3 key elements to a solid golf swing - POSTURE / GRIP /ALIGNMENT - Remember PGA just like the professionals here at Westridge. Merry xmas and a happy new year. It comes around every year and most people are not prepared for it so they end up stopping playing golf until the ban is lifted. However, now you have the chance to get yourself prepared in advance so you can keep yourself playing, even when its a little wet underfoot. It is forcasted that we are due some heavy rain over the next couple of weeks, which may mean that trolleys could become banned for a while, so come and visit us in store and get yourself kitted out with a lightweight carry bag and any other small necesitites such as hand warmers, winter mitts and rain gloves. The first of the necesities for the trolley ban is the lightweight carry bag and we have 3 main lightweight carry bags and all at a very reasonable price. 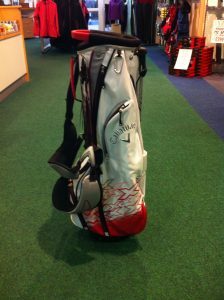 The first is a Callaway stand bag which is a very lightweight bag, has 5 pockets and two of which are a valuable pocket and a cool pocket to keep your drinks chilled. The bag is a very small and slim line bag which is ideal for storage or ease of carriage. 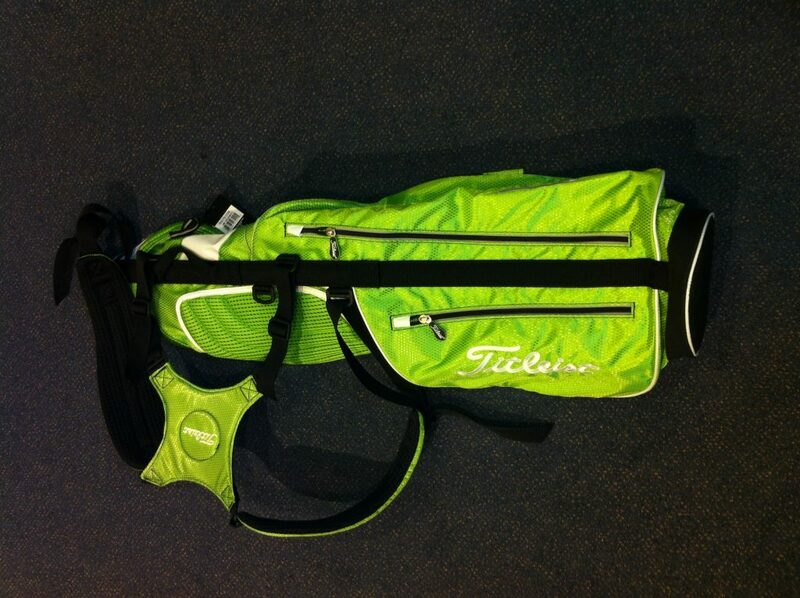 The second is a Titleist pencil bag, which is our lightest bag in our range and is very multi purpose bag as it can also be used as a “range bag” which means you can use it to carry half your set to save carrying the big heavy trolley bags. The bag is legless which is what makes it very light, however, it does come with 3 pockets and a drinks holder. 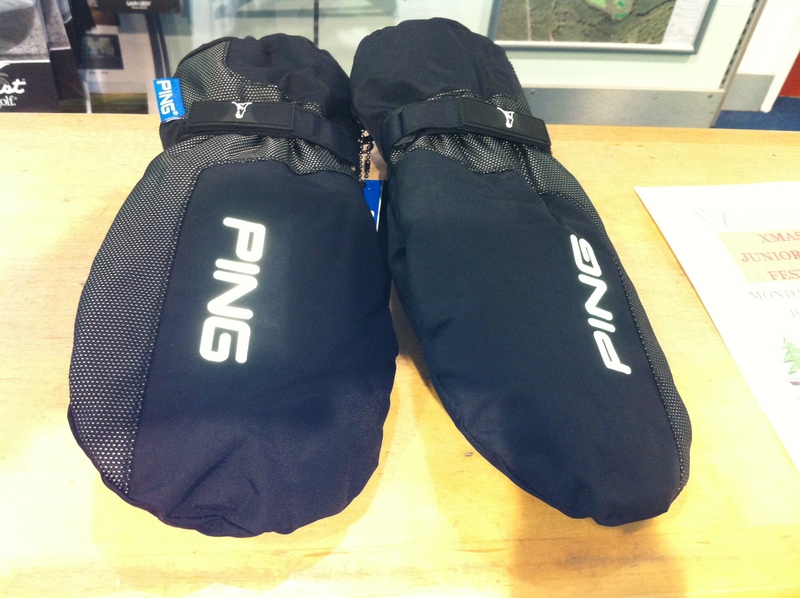 The third and final bag in our lightweight range, is our GO carry bag. This is another lightweight bag, with a single strap carry. 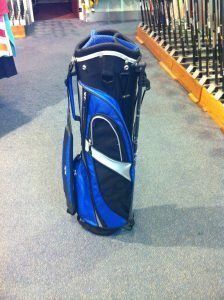 This bag also has 4 pockets and one of which is a valuable pocket, this therefore creates a very slimline carry bag. All bags have enough room to carry a full set of waterproofs, winter mitts and any other small winter necesitites you may need or desire to carry. It is key to try and have at least 2 out of 3 of these accessories in your bag over the winter, to enable you to still hit the same consistent shots without getting any loss of feeling in the hands as this will cause you to have little feeling through the shot and will find it tough to commit and consistently strike the golf ball. Come and see us in store now and get kitted out with every you will need this winter!! How about some more distance? South England squad player Josh Oddy has recently been having lessons with Steve Davis and has noticed a marked difference in his game. A combination of lessons, practice and a correctly fitted driver has meant Josh has been able to acquire over 40 YARDS extra distance. This was due to a variety of factors including his set up and also his existing driver being a poor fit. 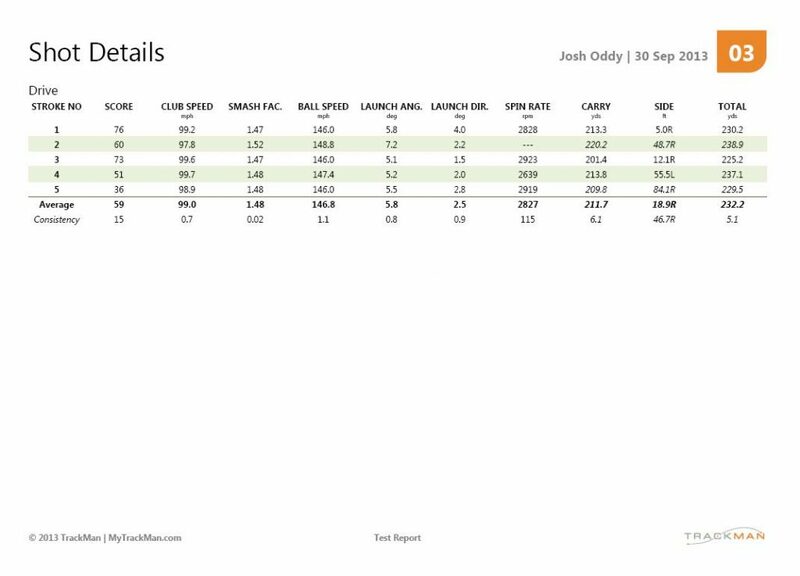 Josh’ average driving distance measured when using the Trackman on 30thSeptember was 231 yards, with a Taylor Made RBZ Tour driver with 10.5 degrees of loft and a Matrix Radix HD6 stiff shaft. As you can see from the figures above the average launch angle was 5.8 degrees, combine this with the average spin rate of 2827 and his clubhead speed of 99mph it produced an average carry of 211.7 yards. The first thing we set about changing was his attack angle in to the ball. His attack angle was around -4 degrees which meant he was hitting down on the ball too much with the driver. By adjusting his posture we were able to promote a more sweeping action with the driver which changed this attack angle and got it into the positive. 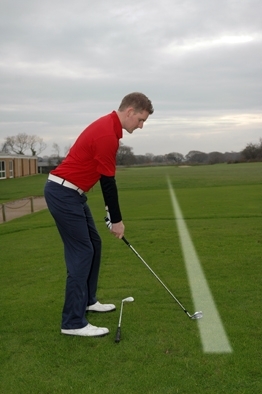 Secondly we looked at the driver Josh was using and looked to improve the initial launch angle and spin rates. By changing to a Taylor Made R1 driver which has a wide range of lofts achievable in the same club we achieved a higher initial launch angle and this helped to increase his carry distance to an average of 255.4 yards. You will also see how the club head speed has increased by around 4mph in a short space of time. 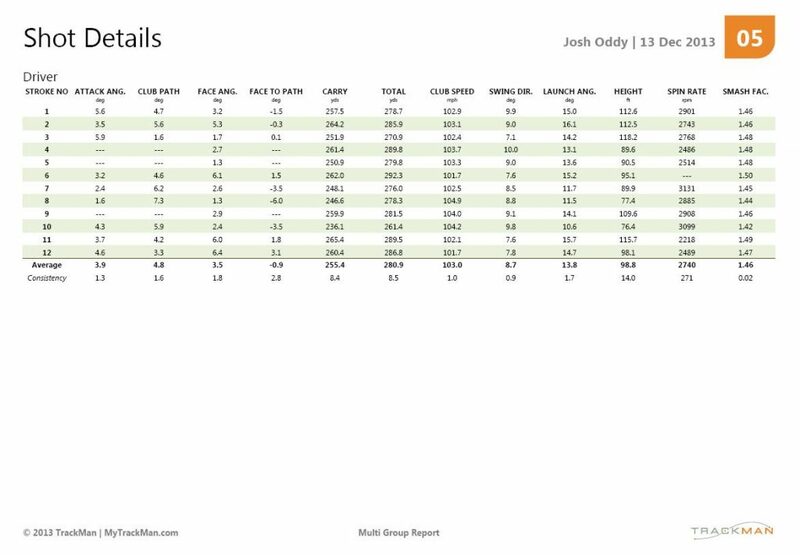 This is partly down to the club fitting and improved technique, but also Josh has hit a lot of golf balls over the last 10 weeks so his timing has got better with his swing.